1. I’m usually one of the youngest people in there. I’m 41. I can’t tell you how terrific this feels. By contrast when I go to J. Crew I’m one of the oldest. 2. Their gorgeous scarves, bags, belts, jewelry, fragrances and Ulysse leather notebooks exist outside of fashion. These are not items that will be out of style by next season, which is good because I can’t do trends. I can only do classics. 3. The Wall Street store, the one I prefer in Manhattan, is so wonderful to step into. On the flip side of the New York Stock Exchange, it is all silver and white and wood, and filled with light, and the sales associates are so nice. The Madison Avenue store, on the Upper East side in the 60’s, makes me slightly jumpy, which is another post entirely. In my experience it’s pretty much ladies with Birkins shopping for more Birkins, which makes me want to say to them, Are you kidding me, people? One is not enough? 4. Their Twillys. The last time I was at the Wall Street store I bought this Twilly in the Grand Manège pattern in the black/fuschia/red colorway. When I first saw a Twilly I wasn’t sure I’d like the size, 33 inches long and just 2 inches wide, but it is so easy to wear and it flaps jauntily in the breeze. The silk feels wonderful and the colors are unbelievable. 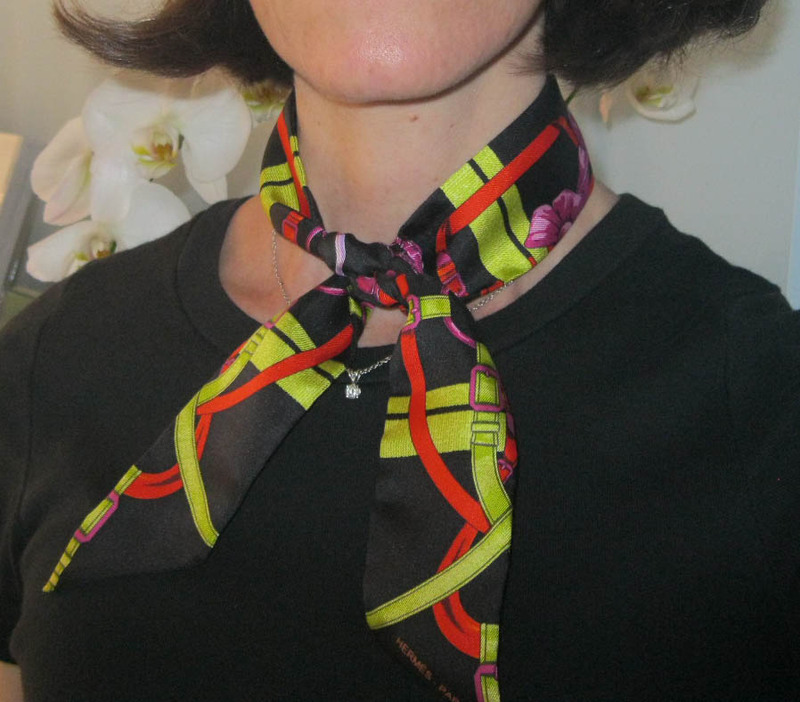 On one tiny scarf they’ve managed to include bright orange-red, neon lime, hot pink, pale pink, and lavender, on a black background and with “Hermès” printed in their signature orange. It’s all a bridle theme and I’m not even remotely a horse person, but I am always into stripes and straps and flowers, so as soon as I saw this scarf in these particular colors I knew it was for me. I realized after a few wearings that what I like about this Twilly most of all is that I put it on and forget about it, like I imagine a guy puts on a tie. Ok. I didn't know the term Twillys. I am now going to apply it to everything 32 inches long and 2 inches wide. Beaute of a scarf, and good post. Bella, you are killing me with your comments here and on Twitter! So fun! I am loving your latest outfit post, all of those vintage ingredients made fresh and modern. I am with Bella...completely twillified!! I had never heard of Twilly's either! But oh how I would love to visit the Hermes store near Wall Street...sounds like so much fun! Ha ha! I should try shopping at Hermes just for the kick of experiencing No.1 too! Because I often feel like a geriatric when I shop at Topshop! I wasn't even aware of this product. Is it long enough to make a feminine bow tie? May have to investigate. Wonderful colours in that wonderful scarf. I know very well what you mean when shopping in very young people stores, but I never care very much hehehehhe. Thank you for asking me to submit my post to IFB Links a la Mode.I have done it just for you, my dear friend. Beautiful tie. Right there with you on not doing trends, sometimes the trends I moved towards became classics so we can't rule them all out. Sounds like fun being the youngest person in the store. I've never ventured into Twillys...but yours is great. The Ulysse...have coveted that TOO for so long! "In my experience it’s pretty much ladies with Birkins shopping for more Birkins, which makes me want to say to them, Are you kidding me, people? One is not enough?" Very beautiful! I'm so glad you found your perfect Twilly--it will keep you company as you wait for your Ulysses. Hi Pam, I wish you were here so we could go to the Wall Street store together. I think you'd love the sale associate there named Linda, who is so helpful and takes the time to educate customers on Hermes silk! Veshoevius, you are SO funny about Topshop, I should go just for the experience. I know I would end up feeling like an old lady in there. They have a store in Manhattan, I believe, but I haven't been to it yet. Hi Paula, if you are one of the people immune to the charms of Hermes bags you should be so happy. You are so lucky! I can't help it, I think they are really beautiful and I'd love to own one some day. But only one, not like Victoria Beckham (and others) with a closet full of Birkins and Kellys. In the meantime, a Twilly scarf gives me a dash of Hermes, without the excessive guilt I know I would suffer if I bought one of their bags retail. Ouch ouch ouch. Hi Terri, you know, I hadn't even thought of making a feminine bow tie with a Twilly but I tried it just now and you CAN make a little bow tie with it. Sacramento, I'm so glad you submitted that post and I'm even happier that it was selected! I think a lot of people needed the reminder not to take themselves so seriously and to maybe have a look at what other bloggers are doing. You and Vahni were definitely on the same wavelength last week. Hi JTWisdom! Thank you for bringing up a very good point--some trends DO end up becoming classics so it's good to keep an open mind. I like so many trends I see but then find they look ridiculous on me. Like maxi dresses. I love them on other people. They make me, however, look gaunt and like I'm trying too hard to be 25 again (no thanks to that, anyway). Hi Vahni, I'm so glad to know I'm not the only one coveting a Ulysse notebook! I see one in my future in the next year or so. I would get a lot of use out of it. I'm going with the medium size, in Blue Jean Togo. I am so very picky about notebooks and pens but I've visited with that size Ulysse twice now and know it's the size and color for me. As for Birkins, I really don't think I could get over the guilt about owning more than one. I love it when I see Rachel Zoe and Victoria Beckham with all their different colored Birkins but I know myself. I could only own one. Hi Catherine! Oh yes, the Twilly will definitely keep me company while I save for a Ulysse. I don't think I can wear it again until October though. It's getting too hot and humid to have it around my neck.